William Faulkner was a prolific writer who became very famous during his lifetime but who shied away from the spotlight as much as possible. He is remembered as both a gentlemanly southern eccentric and an arrogant, snobbish alcoholic. But perhaps the best way to describe Faulkner is to describe his heritage, for, like so many of his literary characters, Faulkner was profoundly affected by his family. Faulkner's great grandfather, Colonel William Falkner (Faulkner added the "u" to his name), was born in 1825 and moved to Mississippi at the age of 14. He was a lawyer, writer, politician, soldier, and a best-selling novelist. During the Civil War he recruited a (Confederate) regiment and was elected its colonel, but his arrogance caused his troop to demote him and he left to recruit another regiment. After the war he became involved in the railroad business and made a lot of money; he bought a plantation and began to write books, one of which became a best-seller. Faulkner's grandfather was the colonel's oldest son, John Wesley Thompson Falkner, who inherited his father's railroad fortune and became an Assistant U.S. Attorney and later the president of the First National Bank of Oxford, Mississippi. Faulkner's father was Murray Falkner, who moved from job to job before becoming the business manager of the University of Mississippi, where he and his family lived for the rest of his life. William Faulkner was born on September 25, 1897 and began to write poetry as a teenager. During World War I, he joined the Canadian Royal Flying Corps - he was too short to join the U.S. Air Force - but never fought; the day he graduated from the Flying Corps the Armistice was signed. The only "war injury" he received was the result of getting drunk and partying too hard on Armistice Day, wherein he injured his leg. After the war, Faulkner came back to Oxford, enrolled as a special student at the University of Mississippi and began to write for the school papers and magazines, quickly earning a reputation as an eccentric. His strange routines, swanky dressing habits, and inability to hold down a job earned him the nickname "Count Nocount." He became postmaster of the University in 1921 and resigned three years later. In 1924 his first book of poetry, "The Marble Faun", was published, but it was critically panned and had few buyers. In early 1925 Faulkner and a friend traveled to New Orleans with the intention of getting Faulkner a berth on a ship to Europe, where he planned to refine his writing skills. But instead Faulkner ended up staying in New Orleans for a few months and writing. There he met Sherwood Anderson, whose book "Winesburg, Ohio" was a pillar of American Modernism. His friendship with Anderson inspired him to start writing novels, and in a short time he finished his first novel, "Soldier's Pay", which was published in 1926 and was critically accepted although it sold few copies. 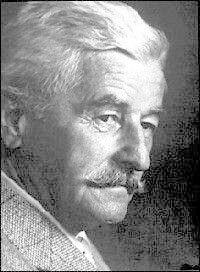 Faulkner eventually did travel to Europe, but quickly returned to Oxford to write. Faulkner wrote four more novels between 1926 and 1931: "Mosquitoes" (1927), "Sartoris" (1929), "The Sound and the Fury" (1929), and "As I Lay Dying" (1930), but none of them sold well, and he earned little money in this period. Finally, in 1931, "Sanctuary" was published and became financially successful. Suddenly Faulkner's work began selling, and even magazines that had rejected his stories in the past clamored to publish them. Even Hollywood sought after him to write. Faulkner's first big purchase was a large mansion in Oxford, where he lived and wrote, gaining a reputation as a reclusive curmudgeon. Between this time and the 1940s, Faulkner wrote seven more novels, including his famous "Absalom, Absalom!" and "Light in August". In 1950, he was awarded the Nobel Prize for Literature, and, in typical Faulkner fashion, he sent his friends into a frenzy by refusing to attend the ceremony (although he eventually did go). In the latter part of the 1950s, he spent some time away from Oxford, including spending a year as a writer-in-residence at the University of Virginia. He returned to Oxford in June of 1962 and died of a heart attack on the morning of July 6 of that year.